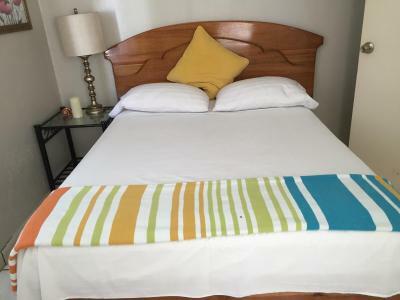 Lock in a great price for Big Fish Guest House – rated 8.4 by recent guests! 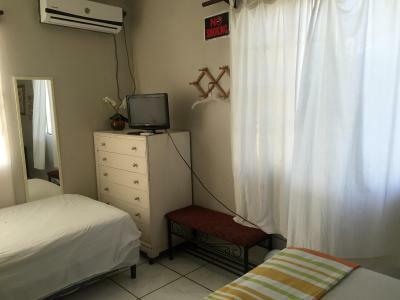 Nice room for a family of four and very clean. Mary welcomed us and owns the restaurant across the street (on the beach) where you can find EXCELLENT food. We only stayed one night before we took a boat to Little Corn Island and we were very comfortable. Beautiful place to stay with the beach in front of the hotel. The staff always there for helping out with whatever you may need. They gave us many suggestions on places to visit and the best places to go for a wide variety of culinary tastes. We went snorkeling right in front of the hotel. A gem. Rooms kept clean as a pin. Fantastic experience and a very safe place to stay. Big Fish is a terrific beach-front stay on Big Corn Island. 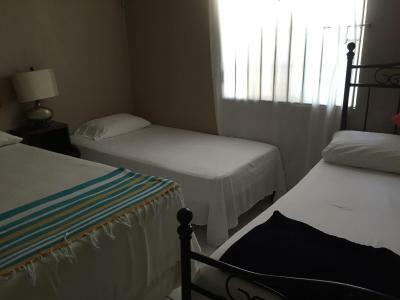 Friendly staff, and a simple, clean, air conditioned room are all you need on the island. Big Fish is really the perfect location on Big Corn Island. Two of the highest rated restaurants on the island are across the street or down the street. Their restaurant is also very good. The beach with supposedly great snorkeling is right across the street (although the weather did not cooperate during our stay). The dive shop is also a short walk down the beach. The staff is extremely friendly and very helpful. 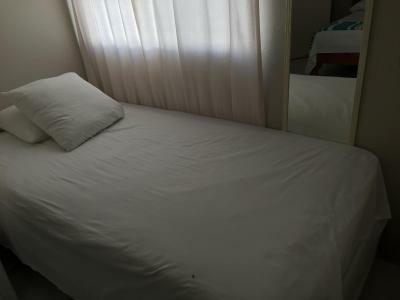 The rooms are fairly basic but that is reflected in the price - but they are clean with hot water showers. They have bicycle or snorkel gear rental and can help you with any planning that you need. 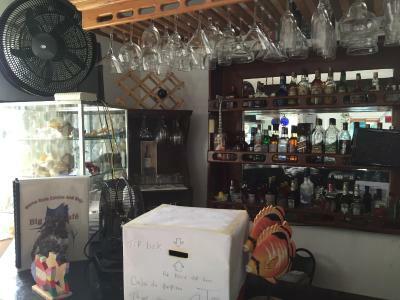 Good location and restaurants nearby, including a great bakery. Friendly staff and easy to get to other locations. It was great to have hot water. 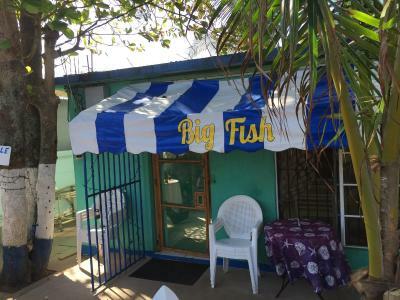 Overall one always has to remember where you are in the world and for Corn Island staying at the Big Fish is a 5 star accommodation. Painted in bright yellow it has the most inviting presentation and they make you feel right at home. It seems like a stop over for the backpackers headed to Little Corn so there is always someone from another country to talk to. Air conditioning and water cooler with free drinking water was great to have. The restaurant was great. The staff was outstanding. Hotel supplied snorkeling equipment and one can walk out the front door and snorkel in the lagoon in front of the hotel. We saw several large rays in the ocean in front of the hotel. Hotel helped arrange a super reasonable private boat trip to Little Corn Island with Captain Charles. Trip included snorkeling off Little Corn Island. Captain Charles picked us up on the beach in front of the hotel. Staff were wonderfully responsive to questions and needs. 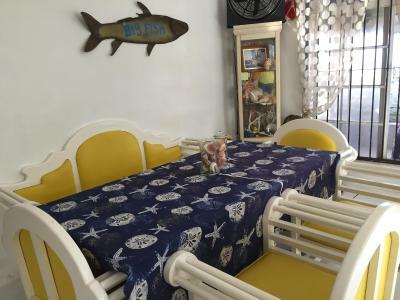 One of our top picks in Big Corn Island.Facing the beachfront in Big Corn Island, Big Fish Guest House features a terrace and a bar. Featuring a tour desk, this property also provides guests with a restaurant. Free WiFi is included. At the guesthouse, each room comes with a closet. 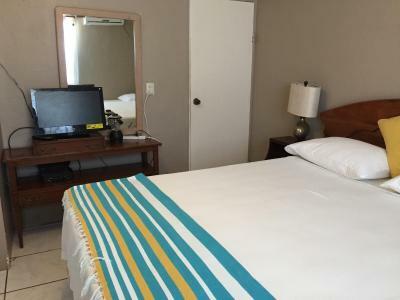 The rooms at Big Fish Guest House come with a flat-screen TV with cable channels. Corn Islands is 1.4 miles from the accommodation. 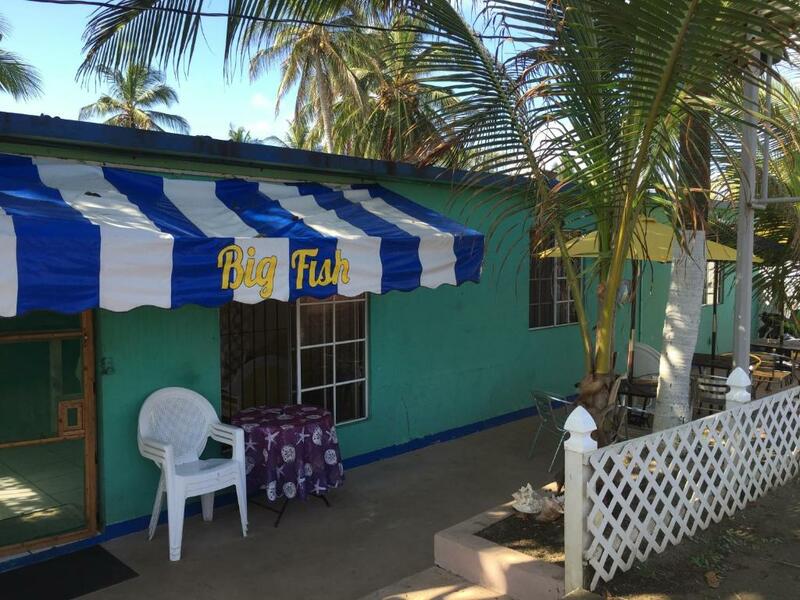 The nearest airport is Corn Island Airport, 3.7 miles from Big Fish Guest House. 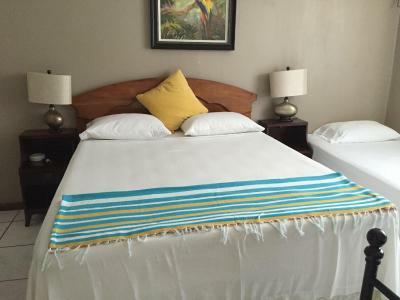 This property also has one of the top-rated locations in Big Corn Island! Guests are happier about it compared to other properties in the area. 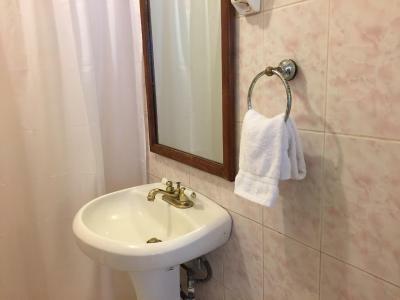 This property is also rated for the best value in Big Corn Island! Guests are getting more for their money when compared to other properties in this city. 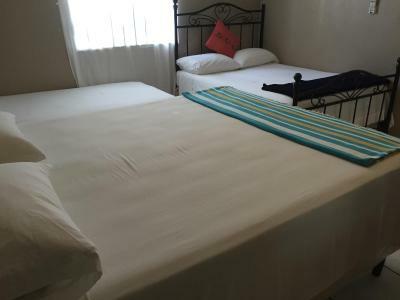 When would you like to stay at Big Fish Guest House? House Rules Big Fish Guest House takes special requests – add in the next step! Big Fish Guest House accepts these cards and reserves the right to temporarily hold an amount prior to arrival. 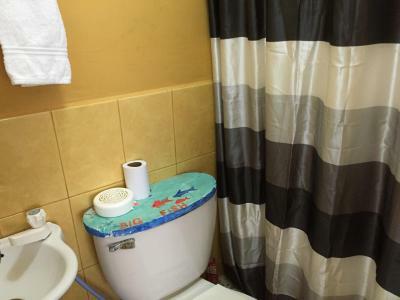 The shower was a little difficult to operate if you’re short. And like the rest of the island - it’s not warm. There’s also no WiFi in the house but the restaurant has. Mary and her kids are awesome. She’s a great host and the property is very comfortable. It’s also next door to the best bakery on the island and close enough to the dive school. There’s a lovely beach opposite and the restaurant is great too! Wonderful gem on Big Corn Island. Came highly recommended from an ex-pat local.... glad I stayed! Three wonderful things about BigFish: 1) incredibly welcoming, kind and nice host. The owner went out of her way to tell me about the area and the history. She went out of her way to give me with sunburn cream after I sat in the sun too long! 2) Nice location on a great beach. Location is everything and how wonderful it was to walk out the front door and have a beach for lounging and swimming just steps away. The beach is white sands, slow waves and postcard beautiful. 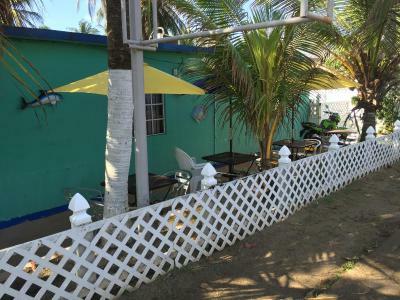 The only thing that stands between you and the beach is a restaurant (owned by BigFish) which has great food- so good that the islanders bring all their guests there! 3) WiFi & A/C. Both strong and refreshing. 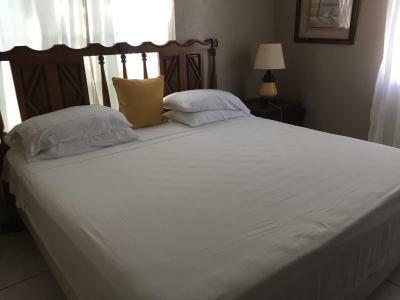 The owners of the property are a Nicaraguan/American family and you can see the love they have for the island and the pleasure they get out of sharing it with travelers. 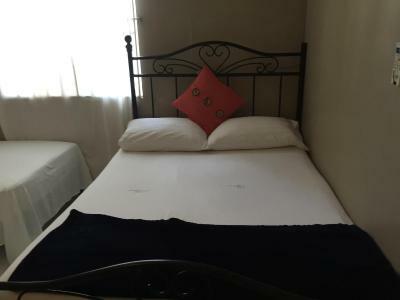 They are so warm and welcoming- you won’t regret booking here! they did not have our reservation when we arrived. they did give us a room and we were happy with it. right across from a great beach. food was amazing. room was exactly what we were expecting based on description and pictures. can rent a scooter to explore the island right next door for $10. i would stay here again. It would be a great addition if they included even a simple breakfast. Food prices on the island can be a bit tourism-inflated, and being able to start the day even with coffee and fruit in the hotel would be a nice touch. Hot water heater was unit attached with electrical wires directly to shower head. Two of us got a brief electrical shock while showering and there was no hot water in any case. The food seemed more expensive than other places we stayed in Nicaragua but seemed comparable to other places on Big Corn. 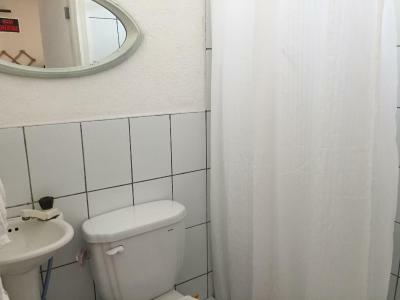 The location of the property was excellent. There are a couple of restaurants, a bakery and a bike and scooter place all right there and it is just across from a nice beach! The staff were very helpful and especially friendly. 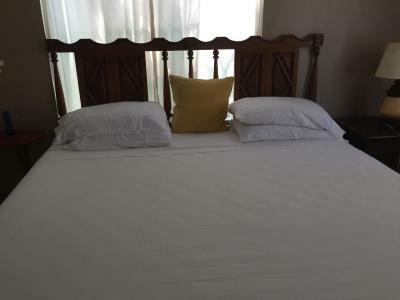 The bed and pillows were some of the best we had in a month in Nicaragua and a/c was nice to. While there was no real view from the room it was very quiet. I thought the food was too pricey for Nicaragua, so I ate at the dive centre or in Bridg Bay or Sally Peachie most days instead. The staff were incredibly friendly and I really felt at home for the week. 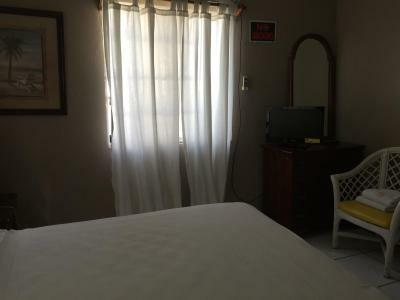 My room was spotless every day I returned home from diving with Dos Tiburones just down the road. 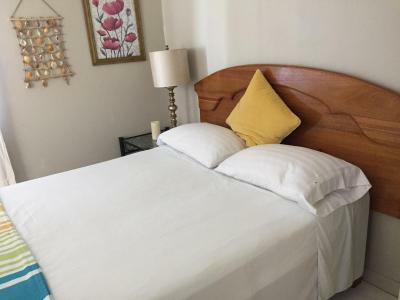 The location is fabulous, ten minutes north of the town and across the road from a lovely, sandy beach. It was close to the beach. Little problem with getting warm water for the shower, but staff dealt with this right away.